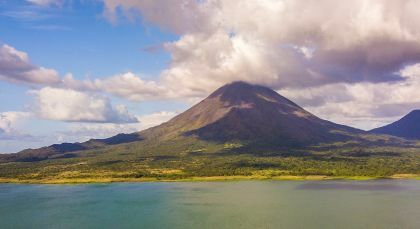 From scenic volcanic mountains and tropical forests to picture perfect beaches and pristine lakes, this classic tour of Costa Rica and Guatemala is a nature lover’s delight! 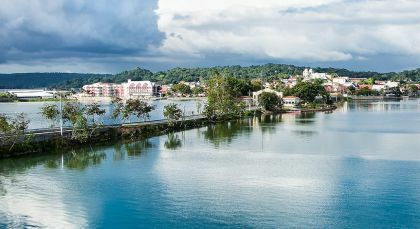 Also on offer are unique excursions in the vibrant cities of Antigua and Flores. Ever been fascinated by the sight of molten lava forming its way out of the earth’s bubbling core? This may be an opportunity of a lifetime to watch an active volcano from a perfectly safe vantage point. After breakfast at your hotel, drive over to the north-western end of the Arenal volcano, which is less than a half hour drive away. Get off ahead of the Las Coladas Trail and enjoy a leisurely hike through tropical rainforests and an old lava flow formed nearly three decades ago. Note the interesting lava formations along this easy trail. Watch out for the region’s local plant and wildlife too. If you’re lucky, you may come across a variety of primates, sloth bears, and birds, including toucans and hawks on your hike. The walking trail ends at an observation area that offers spectacular views of the volcano. Weather permitting, one can spot the fiery lava trickling along the mountain side! (Half Day; Time of Day: Morning; Duration: 3 hrs; Private Activity & Transfer; Fitness Level: Easy; Please bring comfortable boots, insect repellent and sunscreen; Note: A bilingual guide will accompany you). Enjoy a day at a local coffee plantation, followed by a tour of the city of Antigua replete with rich cultural heritage. Right after an early breakfast at your hotel, set off for the La Azotea Coffee Farm on the city’s outskirts. A guided tour of the plantation will put you up to speed with the journey of your favorite steaming beverage from the humble bean to a fragrant cup. Don’t pass up on the chance to browse through the plantation’s coffee museum, as well as the fascinating museum of Mayan music. 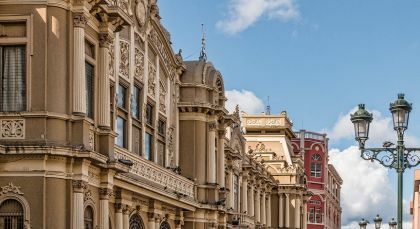 Walk through the halls displaying that great civilization’s cultural and artistic tenets with its pan flutes, costumes, naïf paintings and various ancient as well as living artefacts. In case you’re enamored of Mayan culture, there’s also a textiles and customs museum at the estate. 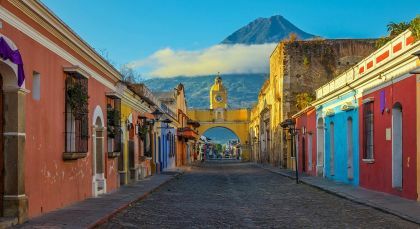 To get to know the local living culture better, you could take a tour of the villages around Antigua Guatemala, exploring the ruins, admiring the spectacular landscape, and interacting with the villagers. 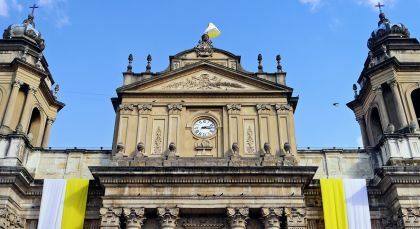 Now for a short tour of Guatemala’s colonial history, visit San Juan El Obispo, which was founded by the first Archbishop of Guatemala, followed by San Pedro Las Huertas. Stop by Guatemala’s former second capital, Ciudad Vieja, which was buried by a mudslide in the 16th century. Come back to the present, with a visit to an experimental Organic Macadamia Farm and the women’s cooperative, Santiago Zamora. The trip to Santiago Zamora comes with various activities and demonstrations of the organisation’s work, such as textile weaving, coffee brewing and dancing to the local music. End your day with a scrumptious local luncheon spread prepared lovingly by the women of Santiago Zamora. (Full Day; Time of Day: Morning; Duration: 6.5 hrs, 0830-1500 hrs; Private Activity & Transfer; Meals included: Lunch; Fitness Level: Easy). Enjoy a perfect day among the spectacular forested landscapes near Antigua, in the company of rainbow-hued birds and butterflies. Leave your hotel early in the morning for a less than half hour ride to San Cristóbal el Alto. Discover panoramic views of Antigua and its surrounding countryside from your vantage point, perfect for taking photographs. Relish a hearty breakfast at a local restaurant, overlooking the volcanic hills beyond, before heading off to Finca El Pilar. Barely ten minutes away from Antigua’s city center, this beautiful forested location is perfect for spotting butterflies and birds. Follow the bird watching trails on this day trip, among a myriad others that head off to other mountain forests, cloud forests, and coffee plantations. Hike through the coffee, pine and oak trees to reach the hummingbird feeder zone, where you get to spot a variety of these beautiful species as they come to feed. (Half Day Trip; Time of Day: Morning; Duration: 5 hrs, 0700-1200 hrs; Private Activity & Transfer; Meals included: Breakfast; Fitness Level: Moderate; Please bring comfortable hiking shoes and don’t forget your camera). Explore the UNESCO World Heritage site of Tikal on this day trip to the national park. After an early breakfast in your hotel, drive off to the fascinating Tikal National Park. Take in your fantastic surroundings of tropical rainforests dense with wildlife and exotic birds, broken by the towering pinnacles of Mayan temples, pyramids and ancient ruins! Enjoy a private guided tour of this spectacular heritage and be prepared to spot a variety of primates and rainbow colored birds. After a long day of sightseeing, relish a delicious lunch at the local eatery, Restaurante El Mesón. Head back to your hotel after lunch. (Full Day; Time of Day: Morning; Duration: 7 hrs, 07:00-14:00; Private Activity & Transfer; Meals included: Lunch without drinks; Fitness Level: Moderate; Please bring comfortable walking shoes and don’t forget your camera or binoculars; trip may start from 05.30 hrs). Head out early from Flores for Yaxha National Park with your guide. Take a private boat ride to the small island of Topoxte which is thought to be the last habitation of the Mayan civilization in the country. Return to Yaxha and explore this important archaeological site that was once a bustling city. 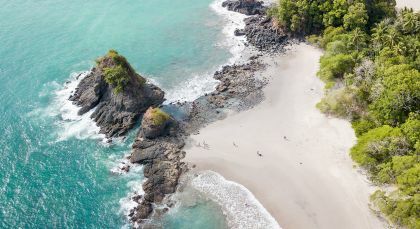 You’ll also have the opportunity to see colorful tropical birds, native spider species, and howler monkeys at this site, which is situated in an ecologically sensitive area. Savor your lunch box in a quiet spot and later, return to your hotel. (Full Day; Time of Day: Morning; Duration: 8 hrs; Private Activity & Transfers; Lunch box included; Fitness Level: Easy).